January 2, 2012 – A multiple collision occurred at noon today on National Route 152, west of General Acha. The accident involved four vehicles, all driven by tourists, and as a result of the accident, tango dancer Andrea Misse, who was in one of the vehicles, was pronounced dead at the scene. The crash was at the kilometer 34 mark of route 152. It was about 16.30 hours approximately. According to the preliminary expertise, the Sandero may have tried to pass one of the vehicles and there the crash occurred. The occupants of the Sandero were the most injured. The car was hit from the front and from behind. The woman on the Renault Sandero, identified as 34 years old tango dancer Andrea Misse, died instantly and was taken to the morgue of the local health center where an autopsy was performed to determine the cause of death. Her husband, Diego Hernán Gienex, 38 suffered a fractured femur, and her 2 year old daughter is out of danger, at a hospital in the capital of the La Pampa. The same happened with the dancer’s mother in law, who was recovering from injuries she suffered as a result of the collisions. 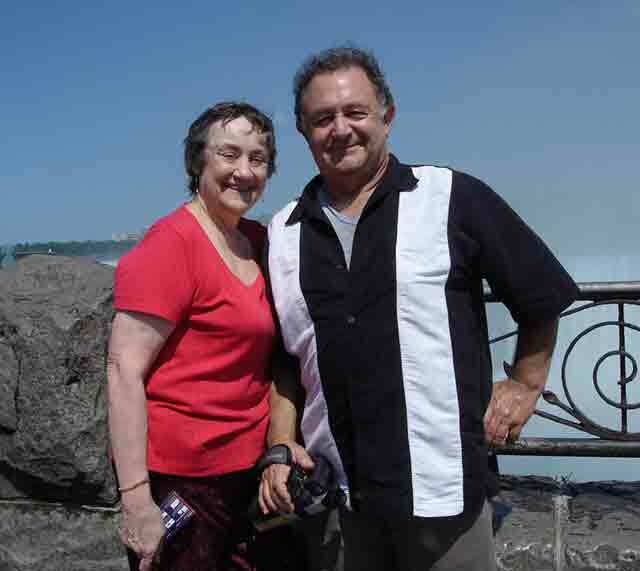 The family came from Tigre (Buenos Aires), where they live, but their destination was unknown. It was a 1996 Autumn night in New York City. In fact it was a Thursday night. We made our way midtown to the restaurant Il Campanello, where Paul Pellicoro presented his Tango Nights show. We had seen this conglomerate offering before, mainly consisting of dynamic Paul and his striking partner Eleny and the professional dancers from his Dance Sport Studio. Raul Jaurena’s first class New York Tango Trio with excellent singer Marga Mitchell; a few expatriate local old timers from Argentina; and the visiting flavor of the month professional couple completed the ambiance. It was a pleasant night out in the world of the tango, a place to sit and eat dinner, have a few drinks, talk with our New York friends, dance a few tangos – you know, the kind of place where everybody knows your name. As the show got underway, a ripple of excitement went through this very experienced audience as two young dancers from Buenos Aires were announced. In true tango world fashion, only first names were offered: Leandro and Andrea. They were going to dance to the music of Angel D’Agostino’s version of Cafe Dominguez. Two very young looking slim dancers held the audience spellbound as they interpreted the music in an entirely fresh, but authentic way. Lots of sighs from the women in the audience as they coveted Andrea’s precise, pretty and musical footwork. Lots of sighs from the women as they drank in the perfect face of Leandro and the way he lovingly and generously partnered his Andrea. Lots of pride in the eyes of the men as they watched this young man execute fantastic figures, combining the speed of youth with the maturity of someone who might have been dancing for thirty or forty years. And then it was over, and in the din of the very enthusiastic applause, we asked a table mate “WHO are they? Are they a new couple in Forever Tango?” The reply was that they were just a couple of kids from Buenos Aires trying their luck on the teaching circuit. We can’t even remember if we had the chance to say hello to them that night and congratulate them. But they made a strong impression on us. A year or so later we were invited to do an exhibition at Matej Oresic’s Tango Generations Weekend event in Ithaca, New York. New York teachers Danel and Maria, Buenos Aires milonguero Toto Faraldo, and “those kids” from Buenos Aires, Leandro and Andrea where the teachers representing the various Tango generations for a weekend of workshops. It was December 1997. We rode the bus from New York City and arrived in a flurry of fairy tale snowflakes to a snow covered Ithaca. The workshops were almost over for the day, so after the various introductions, our lovely house hosts whisked us away to a group dinner and then home to change for the night’s gala milonga and exhibitions. The next day we attended the workshops: first an excellent Vals workshop with Danel & Maria. Then we took an authentic milonga workshop with Toto Faraldo, with Andrea assisting and translating for him. Finally, we participated in Leandro and Andrea’s Tango class. We really appreciated the way they ran their class. They were organized; they presented fundamentals in a fresh and fun way; they were caring and attentive to everyone in the class; they spoke perfect and fluent English. The weekend was over before it began, and the last meals were shared, the last dances danced, the good-byes said. We both agreed to keep “those kids” in mind for future projects. Fast forward to Summer 1998. Final plans were in motion for our Labor Day Tango Getaway in Reno. A disappointing glitch occurred regarding one of the couples we had initially invited. We needed another couple to fill the position. We contacted “those kids” in hopes that they would be available. Those who went to Reno know that the connection was successful. So now we all knew that Andrea Misse and Leandro Palou were professional dancers and teachers. 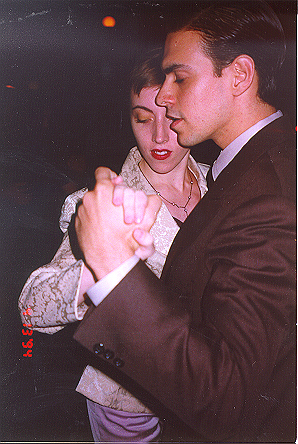 They both began dancing tango at a very young age, Leandro at 14 and Andrea at 11. Before that, Leandro studied acting for five years and Andrea studied Argentine folklore dances, appearing in many performances and television specials in Buenos Aires. 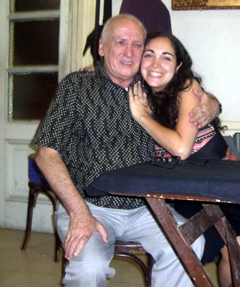 Andrea began her tango studies with Carlos Rivarola, one of the stars of “Tango Argentino.” She studied for several years with Miguel Angel Zotto (Tango X 2) and later with Osvaldo Zotto and Antonio Todaro, considered by many to be the greatest teacher of tango choreography of all time. Leandro also studied with Miguel Zotto and with numerous milongueros. Leandro and Andrea’s partnership began in 1995. 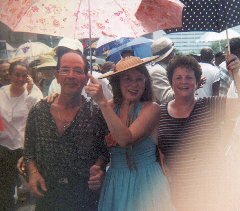 They danced with the Color Tango Orchestra and toured in the show Milonga Boulevard. They presented successful workshops on both the East and West coasts of the USA, and also in Europe. As well as being a top rated professional dancer and Andrea had her degree in simultaneous translation. They had a true and unique philosophy of Argentine Tango being danced as a fifty-fifty proposition for the man and the woman. Andrea had been in the presence of many important teachers and dancers, but she felt that something was lacking in the information provided for the woman dancer. She took it upon herself to investigate a system of techniques that enable the woman to create a beautiful head to toe body line, to be completely responsive to la marca, and create the possibilities for musical interpretation through embellishment. 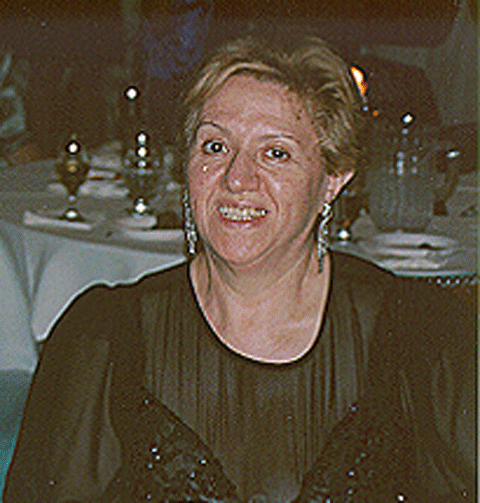 One of the teachers of technique that she greatly admired and appreciated was Graciela Gonzalez. To compliment Andrea’s approach for the woman, Leandro had developed a series of men’s techniques that also stressed the importance of body alignment and balance. He taught the men clearly and easily to mark the woman’s steps in a precise, understandable and generous way that allows her the time and the option to simultaneously interpret the music along with him. For him, this is the way to dance with the woman, which he contended is the reason men want to dance tango in the first place. Both young, but already world famous and acclaimed teachers from Buenos Aires, Leandro and Andrea teach in the tradition of best teachers from the Golden age. They remain faithful to and teach Tango de Salon, the most elegant style of tango dancing. In 2005 Andrea became the professional partner of Javier Rodriguez and together they traveled all over the world with great success. In 2008 she and her husband Diego Hernán Gienex were blessed with the birth of Guadalupe. Her daughter and her husband both survived the crash that took the life of one of the most exquisite tango dancers of the new generation. The news was devastating, our hearts ached with sorrow, and the tears flowed out of control as we read the Pugliese children’s announcement of the sad news of the passing of their mother Esther Pugliese.The world of tango has suffered an irreparable and irreplaceable loss. For those who have been touched by the angel of Esther, words can not begin to describe the deep emptiness that her passing represents. For us it is very painful..
For most of 1996 and the early days of January 1997 we had been driving south from the Bay Area to Southern California four days a week to teach and dance tango. One morning the phone rang in the kitchen of our friend’s home in Los Angeles and she stopped tossing the salad to answer the call. 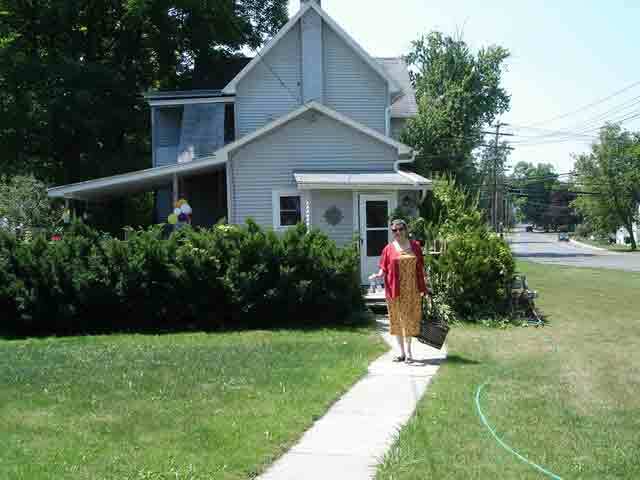 Our friend was our local promoter and we stayed at her home. After a few minutes of animated conversation in Spanish, she handed me the phone and asked me to talk to the person on the other side of the line. His name was Mingo and he was calling from Buenos Aires. His wife, son and daughter were coming to California and he wanted somebody trustworthy to house them and handle their tango tour. Our friend thought we would do a better job than she could. One week later we picked up Esther, Pablo and Marisa Pugliese at the San Francisco airport. We didn’t know then that our lives would take an unexpected turn and change forever. For almost a month we shared our home with this family, and we chaperoned then all around tango communities in San Francisco, Sacramento, Santa Barbara and Los Angeles promoting and translating Esther and 16 years old Pablo classes. At the time we had almost two years of tango experience but as we listened what the teenager had to say, witnessed the way they taught, and began to understand the logical and methodical way in which they developed their lessons, we started to think that somewhere in Buenos Aires there was a hidden treasure of knowledge. Somehow the idea that there was a method for this tango madness began to settle in. By the time their stay with us came to an end, we had been exposed to an incredible wealth of information we had never heard or seen before. We also had become intrigued about the person they talked about with awe and reverence named Mingo, who eventually turned out to be Esther’s husband, and Marisa and Pablo’s father, although the words husband and father never came out of their mouths. This collage of photos is offered in loving memory of Esther Pugliese, RIP. And here are the words of Esther Pugliese from an exclusive interview recorded at Stanford University in 1997 during the last Tango Week. On May 22, 2003 at 4 PM local time in Buenos Aires, our dearest Nestor Ray passed away, fifteen days after he had returned to his beloved Buenos Aires. His sister Josefa Luisa Raiano indicated that he died peacefully following a cardiac arrest. Dealing with matters of life and death is a difficult task when different cultures are involved. We made the choice to follow the dictates of our conscience and express our feelings with the honesty and integrity that the loving memory of a friend like Nestor Ray deserves. The absurdity of funerals and postmortem homages is that they serve those who stay alive but do very little for the ones who died. A poet wrote that we need to tell about our love for others “en vivo,” while they are still alive to hear us. A week earlier we had been dancing in Rome. There, a dancer from Buenos Aires who has known Nestor Ray for many years, spoke of her concern for Nestor’s health. A few days later while picking up e-mails at Rome’s Central Railroad Station, a message from a teacher, organizer and Nestor’s host in Los Angeles read, “Nestor is in very grave condition” and had “very little time left.” He had been taken to Cedars Sinai Hospital Saturday, May 3 because “he could not walk.” A second message indicated that Nestor had been discharged from the hospital Sunday evening and the doctor said it was okay for him to travel to Buenos Aires. The phone call with the sad news of his death caught us unprepared. Suddenly nothing mattered more except shedding tears, surrendering to grief and allowing the mourning to begin. Nestor Ray traveled around the world under the sponsorship of dozens upon dozens of promoters, who saw their communities and their own personal careers benefit with prestige because of his presence, talent and generosity. When we were told that his family couldn’t afford a simple funeral, we wired the required amount of money overnight to take care of the problem. We then suggested that anyone wishing to help could contribute to a fund set up on the Internet. Only four among the dozens of the aforementioned promoters joined a handful of individuals who had known Nestor, united by their desire to show their respect by insuring that he had a decent and dignified funeral. He was born Salvador Pedro Raiano on April 19, 1945 in Villa Ballester, Buenos Aires, the son of an Italian horse caretaker and bricklayer, also named Salvador, who died young almost at the same age Nestor died. His mother, still alive at the time of his passing is nearly 90 years old. She was married twice and had a dozen kids. He acquired his nickname “Nestor” from a prison gang where he spent a great deal of time taking the blame for his younger brother’s robberies. Bad behavior and rebellious attitude earned him a trip to the notorious Zapala correctional facility in the southernmost tip of Argentina. Finally, after he was sent to a Juvenile Rehab center, he learned to be a tailor and an upholsterer, professions he made good use of during his adult life. He became a teenager at the dawn of a period of military rule that would change the way people lived and died in Argentina. Rock and roll was sweeping the airwaves and tango was only danced in traditional settings in neighborhoods with a long standing reputation for the caliber of their dancers. By his own account, at age nine he learned his first dance of embrace to the sound of “chamames” and “rancheras,” popular dances from the north eastern provinces of Argentina. Downtown, in the clubs of Buenos Aires, Conga, Mambo, Cha-cha-cha and Boogie-woogie were popular dances inspired by the likes of Fred Astaire and Carmen Miranda on the silver screen. In 1956 Bill Haley and his Comets rocked the city around the clock and the fever that ensued captured the imagination of youngsters nationwide. Nestor was one of those gifted “rockeros” who became a sensation winning dance competitions by the time he turned seventeen. In 1960, he started working as a jockey, but his passion for dancing kept him away from training sessions and denied him the opportunity to participate in any races. His tango dancing began as with most young kids, hanging around the “viejos,” watching and practicing in front of a mirror, making mistakes and alternating the roles of men and women with the other kids. The elder milongueros advised him to develop a personal style, to dance with feeling and to look at tango as a hobby and not as a business. Somebody noted in the aftermath of his death that Nestor had spent more time dancing for joy than for money. And he may have just remained one of those anonymous milongueros, whose names are only known to a close group of friends who shared the same joy for the dance. He might have spent his days toiling in a body shop, fixing dents and reupholstering car seats. He could have continued winning tango tournaments joining Fino, Pupi, Todaro, Kalisay, Balmaceda and others giving exhibitions all over the blue collar clubs of Buenos Aires. If it hadn’t been for actor Robert Duvall. During his last stay at our former residence in California in 1999, Nestor talked at length about his relationship with Robert Duvall. There was a time when the actor, fascinated by a dancer he’s watched spinning with grace and rhythm in the movie “Tango mio,” went to Buenos Aires looking for him. 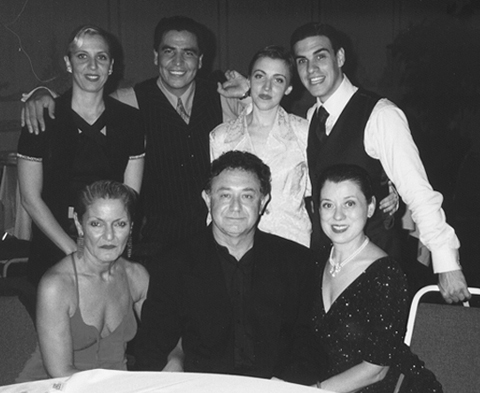 At the time, the members of the original cast of the show “Tango Argentino” were basking in the glory of the international success of the show, and almost everyone from Mayoral, Virulazo to Copes took turns teaching tango to the famous movie star while at the same time claiming not to know, or having no idea who this guy was that Duvall was looking for. According to Nestor, he had been dancing many times at the same places where Duvall was rubbing elbows with the TA cast. One day, as Nestor was asked to do an exhibition, Duvall introduced himself and said that he liked the way Nestor did the “giros,” and that it reminded him of a guy he’d seen in a movie but couldn’t find. Cut to a farm in Virginia. Nestor was now being touted as Duvall’s personal tango coach. Dissolve to a sidewalk cafe around the block from a Washington, DC. theater where “Forever Tango” was playing. We were managing Carlos Gavito’s workshops in all the cities where the show played. The year, 1996 and joining us at the table were the aging actor, Nestor Ray and Marcela Duran (she never realized that she could have been the star of Assassination Tango judging by the way she blew off the advances of a smitten Duvall). Later that July, Nestor was announced as a last minute addition to the Stanford Tango Week faculty. With no command of English, fighting health problems and paired with an egocentric young Argentine dancer residing in the Bay Area, Nestor’s debut in California was a flop of major consequences. Remarkably he was able to recover, turning a negative experience into an educational one. As he learned from his mistakes he began a new phase in his life, first becoming a master-in-residence in the San Francisco Bay Area, and later being a good will ambassador in tango cities all over the world. He often told about the experience he shared with Juan Bruno while rooming on campus during Stanford 1996. A raccoon had made its way from the nearby hills and stood in the middle of the room when they walked in. Such was their scare and their terror that for long minutes they were both convinced that they both were in the presence of an extraterrestrial creature. Everywhere he has been, there are many people who can share stories, anecdotes and tales from the rich and colorful mind of Nestor Ray, people who somehow have chosen not to make their video memories of Nestor available for a commemorative tribute reel. A memorial web page was set up on Planet Tango’s website www.planet-tango.com/nestor.htm). Nestor liked the concept of Assassination Tango and he claimed to have contributed to the original script. He was looking forward to the filming of the movie. He took credit for introducing Duvall to Luciana Pedraza, who worked as a tourist office in Buenos Aires, adding that when she first came to the US he introduced her as his cousin because of Duvall’s contested divorce. He felt sad about the circumstances that eventually edged him out of Duvall’s inner circle, but he wouldn’t elaborate beyond that. We will always remember the contagious and joyful nature of his personality and dancing style. We hope that his legacy will be one of hard work, honesty and generosity to inspire future generations. For more than seventy years the neighborhood in the Agronomy district has not changed much. The familiar sight of ladies washing the sidewalk and cats playing on top of the cars parked on the street are a common daily occurrence. Then there is that house where Chula Clausi lived surrounded by piles of musical scores on the table, on shelves, on chairs. Close to 500 of his own published works. Where visitors grew accustomed at being received by a man dressed like he was going to a concert. On February 17, 2010 something changed. 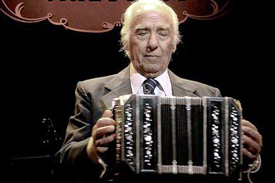 Don Gabriel, the 98 year old neighbor, known by many as the bandoneon player, composer and arranger Chula Clausi, died of respiratory complications. With his departure, he took with him a fascinating and mysterious centennial history that includes a major swath of the evolution of the tango. His life trajectory includes a active role in the fostering of the Guardia Vieja all the way to a late rediscovery of his talent way into the 21st century. A mixture of religious man and modest person, he preferred to say that his trajectory and the general recognition he obtained in the last few years were “a gift of God”. Actually it was a hot and humid summer night that God chose to work His mysterious ways via rock and roll band Los Piojos (The fleas). Already into his nineties in 2003 Clausi surprised the standing room only 70,000 plus crowd at River Plate Stadium when he slowly walked with an old time elegance across the stage, totally dressed in white as a guest of Los Piojos. 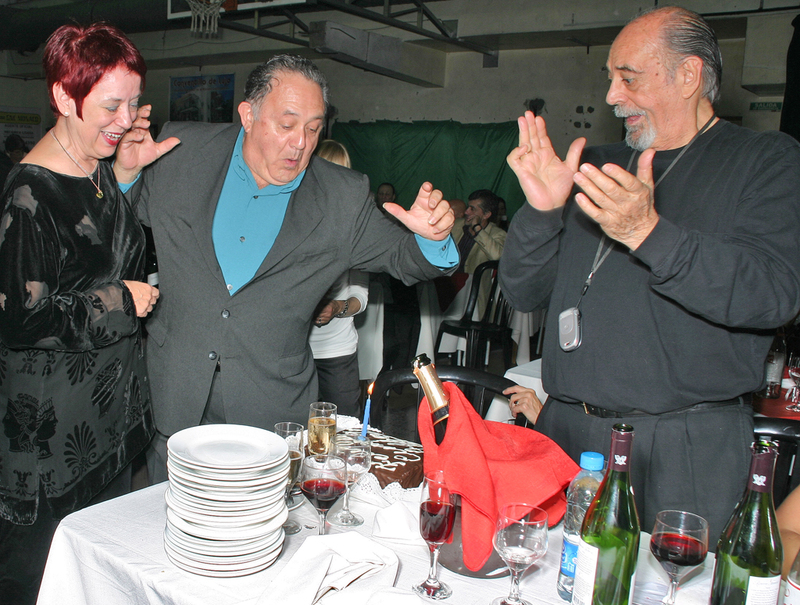 He got an thunderous ovation as he pulsed the always austere and confessional sound of his bandoneón. Something similar happened a couple of years later at the Teatro Colon. He walked slowly on stage, delivered an intimate interpretation and received the unanimous applause of the audience. Of course, that was the Cafe de los Maestros CD Release Party night. His presence among other glories of the tango stood out not only for his longevity conjugated with vitality but also by his subtle style and his rich history. And with the launching of Gustavo Santaolalla and Gustavo Mozzi’s project, the journalistic curiosity and the attention of a public not necessarily tanguero were focused on him. It’s not unusual for Argentines to venerate dead people with fanatical passion while being blase about those still alive, but Clausi was already playing at Teatro Astral at age 15 with the Francisco Pracánico orchestra along side Miguel Calo. In 1928 he was part of the Roberto Firpo orchestra, recorded and played with Pedro Maffia during five years, was one of the main members of the orchestra of Julio De Caro in 1936, knew Carlos Gardel, composed with Celedonio Flores, Enrique Cadícamo, Francisco De Caro and Jose Maria Contursi. Strictly speaking, he had known them all. He was part of the representative ensembles of the Guardia Vieja led by Juan Maglio “Pacho” and Roberto Firpo. 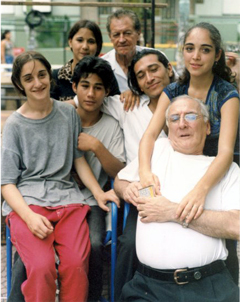 But its main influence was Pedro Maffia, the father of a whole stylistic school of bandoneón playing. For Clausi, the golden decades of the tango had been the 20’s and 30. Later he missed the definitive consecration: during the 40’s and part of the 50’s he lived and worked in several countries of Latin America, mainly in Chile. 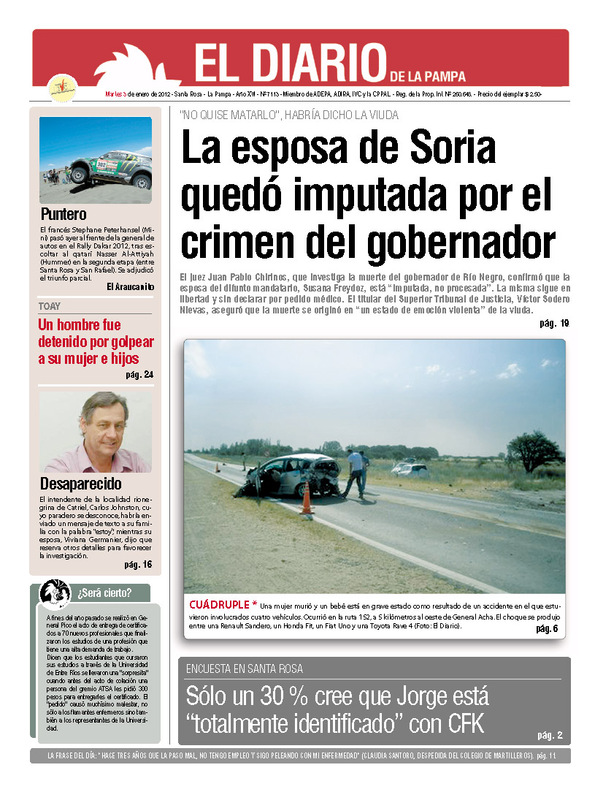 Peculiarly – and also, unfortunately, he returned to the country when the tango began to wane. Gabriel Clausi always played the same since the beginning, trying to do what he felt. His artistry didn’t reside in the virtuosity, it was in his expression. “Chula” never touched with his fingers nor with his brain. He played with his heart. He has now graduated of immortal, and his name has become synonym of legend.